A collection of programs aimed at the Hibernate beginner to intermediate user. 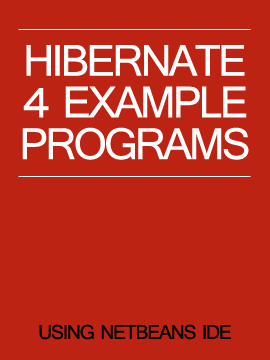 There are nearly 20 example programs in this ebook as of this writing (covering beginners' Hibernate). I will be continuously updating the book with more sample programs (buyers of the book receive all updates free). If you notice any technical issue with the book, please contact me through my blog: L. Mohan Arun's blog. I am a 12+ year experienced software professional, mainly worked with Java and J2EE.